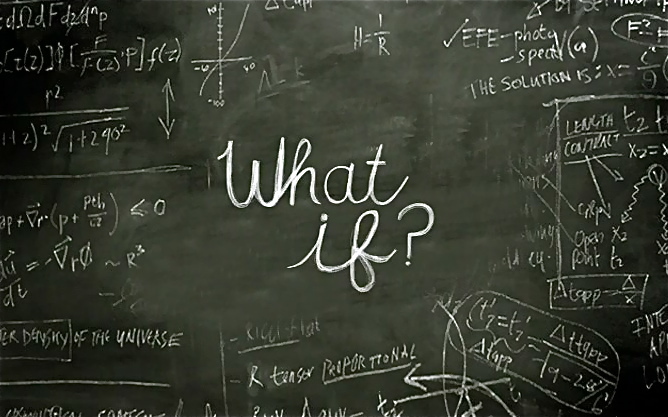 I want you to go on a little trip with me–a “what if” trip. A trip to an imaginary place, where everything you know and value and feel is suspended for a few minutes. In this place, when you come in, there will be shelves. You will be asked to put all that you think and feel about your children, all of your frustrations, all your guilt or questioning or dogma or certainty or wisdom, and all that you think and know about yourself and your role as a parent into a special little cubby for safekeeping. I promise you it will all still be there when we get back. Guaranteed. It won’t be a long trip. You’ll be back at home, safely ensconced in your life, values, and beliefs, before you know it. There is no danger, and no commitment. It’s just an experiment. You in? Ready? Great. Let’s go. Come on in. Yeah, you need a break. I can see that. This parenting thing is a rough gig, isn’t it? Come on in, we’re so glad you’re here. Over there on the wall, you see those beautiful blue bags with the gold drawstrings? Put your stuff in there. All of your stuff. And when I say all of your stuff, I mean all of your stuff. Even the “stuff” that isn’t stuff. Put it all in there. We fully guarantee that it will be safe and there will not be a single thing missing or out of place upon your return. Throw it in there. Great. Now put your bag in that cubby over there with your name on it. I’ll wait. Welcome to our meeting room. You will probably notice at once that there are no toys to clean up or legos to step on or dishes that need to be done here (and no spilled food or drink!) You should know that the room is entirely soundproofed–for our purposes, what that means is that no sounds emanating from or produced in any way by children are audible. Nice, eh? It also means that what you feel here or say here stays here. No one will hear it. No one will judge it. No one will even know you think it. There are snacks and drinks over there. Sit where you like (oh, man, that chair with the down-filled cushions over there is a dream come true.) Or stand. Or lie down. It’s all good. Remember to breathe, though. Breathing is good. Hmm. I can see from your faces that some of you are realizing that you have forgotten how to breathe. Don’t worry. It happens to most of us. Occupational hazard. I’ve had my share of shallow breathing and breath holding, too. So let’s review, especially because I’d really like all of us to come fully into the room. So, before we start, we’re going to learn (or practice, for those that already have this down) a couple of nifty breathing exercises. The first one is something called 4-7-8. Easy to remember, right? The purpose of this one is to relax. I ask you, who needs instant relaxation more than parents? We all have busy lives…this is one you can use anywhere, anytime, and in only takes a minute (think of it like a little teeny miniature trip to a spa!) Here’s how it goes. Do it with me. First, put the tip of your tongue against the roof of your mouth, right behind your front teeth, and keep it there throughout the whole exercise. Now exhale completely through your mouth. Close your mouth and inhale through your nose to a count of FOUR. Hold your breath to a count of SEVEN. Exhale through your mouth (make a whoosh sound, with your tongue still in place against the roof of your mouth just behind your front teeth) to a count of EIGHT. Okay, now we’re going to repeat the whole thing three more times, so four cycles of 4-7-8. Let’s do it, all together. That’s it. Really. How long did that take? Less than a minute? Hold on to 4-7-8. You can use it when that library books gets ripped or flour is all over the kitchen floor or your tween rolls their eyes at you. Inhale four, hold seven, exhale eight. Got it? Good. The second breathing exercise is to help you be “mindful”, which just means (in this context) to stay present and in your body, also really helpful in cases of flour, broken toys, and sometimes when babysitters cancel at the last minute on your first date night in six months. I love this one. Here’s how it goes. All you’re going to do is breathe quietly and slowly. No instructions. 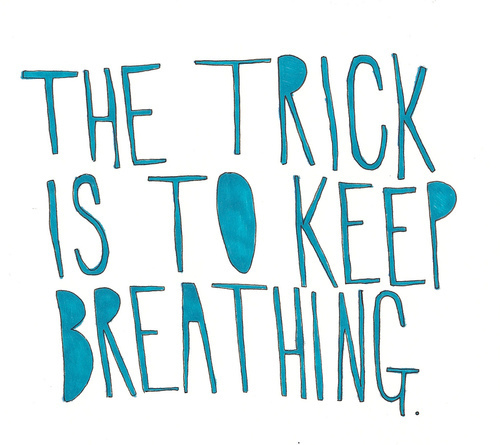 Just breathe normally, trying to keep it quiet and slow, but even if you can’t do quiet and slow, it’s all still good. Closing your eyes can help, but sometimes that’s not possible, as we all know. All you do is count on every exhale. The first time you exhale, you say (silently) to yourself “One”. The next time you exhale, you say (silently) to yourself, “Two.” You know, counting. You do it up to five. And then you start over at one again. You do it for as long as you can. If you lose track, no big deal, you can just start over again at one. We’re going to do it together for three minutes to start. Sometimes I do it for ten minutes. If I have ten minutes. Which I usually don’t. But still. It’s good to set a timer. Just count your exhalations, up to five, and then start over again at one and count exhalations to five again. You know what I love about this one? You know what I really love about this one? Im not going to tell you. You’ll see. Let’s do it together. If you’re anything like me–or the hundreds of people I’ve done this with–you probably found yourself, at some point either saying “eight…nine…” or you have been unsure where you were, and you had to start over at one. Those were moments–you guessed it–in which you weren’t, well, quite here. And I really want you to be here, because we’ve got something important to talk about, namely that “what if” question. And I also really want you to be here because I want us to all be here, because we get so little time to ourselves, so little time to breath, so little time when there are not children talking or crying or asking things, or places to go or things to do. We live overfull lives. It’s really no wonder that we can’t simply count to five and repeat it without becoming distracted–and yet it’s surprising at the same time isn’t it? It’s important, being here. As we used to say in the hippie days, be here now. Hey, there were some profound wisdoms in all that stuff. You can’t be present for your children and present in your emotional responses if you’re not present in your body and mind. It’s just a fact. Okay, so that’ll do for the breathing exercises for now. Feel free to take those with you when you go. Maybe you can even use one of them when you’re emptying out that-bag-of-stuff-that-you-left-in-the-cubbies-outside-that-I’m-not-even-supposed-to-remind-you-of-because-if-you-start-thinking-of-all-the-things-in-that-bag-you’re-not-going-to-be-here-with-us-anymore. Oops. Sorry. It happens. Breathe and move on. Just like in life. Just like with kids. So. Everyone relaxed? Comfortable? Open? Ready to consider? Great. Let’s move on. Here’s my question to you. The one I want you to consider without any of your stress or preconceived notions of parenthood. What if there were one–actually ONE–thing you could do that would dramatically impact your lives with your children, including positively impacting their behavior? One thing. Not a whole parenting book. Not a whole list of instructions of what to say when they have a tantrum in the grocery store or how to stay calm when your kid refuses to brush their teeth or pours a glass of water out on to the floor, while looking at you with a gleam in their eye and a broad smile on their face. Just one thing. One thing that you could do–regardless of your child’s age–that would create an enormous shift? Almost like a magic thing, like a secret. Would you do it? Depends what it is, I hear you saying. Fair enough. Does it help if I tell you it is not something like needing to make sure that you get two hours of “me” time every day, meditate, go the spa, go out with friends, eat well, sleep well, and all the other things that are virtually impossible but that everyone knows would really help turn things around? Is it easier if I tell you that this is something that doesn’t cost a penny? Does it make a difference if I tell you that it is something you can do that will work, whether your spouse or your child’s other parent agrees with you about parenting (or about doing this thing) or not? How about now? Are you in? Oh, you sticklers. You want to know before you commit. You’re a thoughtful bunch. What if positive regard was enough? What if being attentive to the words and the thoughts and the emotions that we have and listening closely to whether they demonstrate genuine positive regard were enough? What if we could be open to maybe even asking others to “check in” with us when we slip and we say or think or do things that demonstrate a lack positive regard, so that we can keep tabs on ourselves and gain insight about how we move through the world–what if that were enough? Would you do it? I mean consciously and intentionally reminding ourselves in moments of stress that our children are good people with wonderful qualities. I mean maintaining a working foundational assumption that our children are never (and I mean never) doing something “just to annoy us,” but that their behavior is always about seeking to satisfy a real need. And when we catch ourselves feeling or thinking otherwise (which we ALL do), returning to that assumption. I mean acknowledging that all children, deep inside, want connection, want to please, want their parents to be happy with them (and to be happy, in general). All children want to be fully seen, respected, and appreciated. Even when–especially when–their behavior appears to indicate otherwise. I mean committing to noticing when our frustration leads us into using value-judgment laden words to describe our children, and intentionally returning to what we know to be true when we are in a more grounded (or well rested or well fed or nurtured) space. 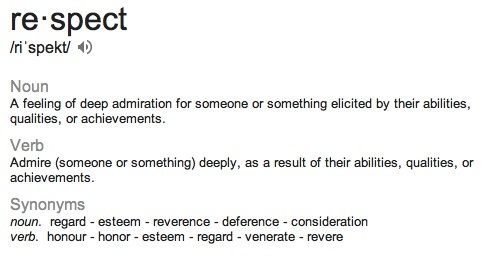 For example, many of us use statements like like “she’s so unbelievably rude” (I certainly have.) The thing is, “rude” doesn’t really mean anything, because it’s not descriptive and it’s wildly subjective. When I work with parents, and they tell me their child is being “rude” and they want my help with it, I know absolutely nothing at all about what the child is doing, other than the fact that the adults are annoyed by the behavior. If I want to address the behavior (which we often want to do…who wants to deal with rude kids? ), I have to know what the behavior is, not how other people feel about it. The same goes for “obnoxious” or “disrespectful” or “bratty” or “impossible” or “horrible behavior.” They mean nothing. Remind yourself to speak about your children–in your own mind and to others–with positive regard. Sure–say that you’re frustrated (which is you owning your emotional response)–we all get frustrated, sometimes really frustrated. Yes, talk with others about what your child is doing–precisely, clearly, descriptively, objectively. Make a commitment to notice when you veer into “he’s spoiled” or “she is impossible” or “it’s like living with monsters.” We all do it–this isn’t about feeling guilty about thinking or saying those things, it’s about noticing when we think or say them and returning to our better selves. I mean noticing and considering shifting our thought stream from “having to think of things to do with them on a rainy day” to how enjoyable it is to spend time with these people, much the same way you would feel if you were spending the weekend with some of your closest, funniest, and most cherished friends. It’s really the magic potion. I promise. Return to respect. The “Return” is key. None of us live there all the time. We’re human. Saying we’ll always be respectful is impossible. Making a commitment to return to respect and positive regard is doable. I’m promising you. This is one thing you can do--without money, no matter what other people think, no matter what the parenting books say to do or say, no matter what the behavior is that is troubling you or sending you to your “safe house” in the bathroom behind a locked door so that you can cry or scream into a towel or look at yourself in the mirror and remember that you are the person who cares for this child —that will transform your relationship with your child or children. Why? Because of self-fulfilling prophecies. Because children become what we expect of them. Because the things that we say to ourselves (and to our children) become realities. Because energy begets energy (as earthy crunchy as that sounds). Because when you open your eyes in the morning, and your soul is filled with dread about the certain and inevitable battle over breakfast or getting dressed or getting out of the door, you will have that battle over breakfast or getting dressed or getting out the door. The bad news here is that we all get stuck in those negative expectations sometimes. The good news is that we are in control of our own thoughts, and we have it in our power to change what happens by changing the way we think about it. Really. Power. It’s heady. A word of caution. Be careful. Don’t mistake me here. I’m not talking about love. I’m talking about respect. They’re different. We all love our children. I’m certain of it. I’m also certain that there are many of you–maybe most of you–here right now who can easily think of a time in which you are certain that you were loved and yet you did not feel that you were respected. How does it feel? Do you find yourself venturing into that memory and concluding that love was all you needed (no disrespect to the Beatles here) and that respect just wasn’t all that important? Or do you perceive a hole of sorts where you wish the respect had been? That alone should speak volumes to you about their relative value. I’m not suggesting that you should teach yourself to see the world through rose colored glasses or never feel frustrated about not being able to send active kids out on a rainy day (though of course, you can send them out on a rainy day, but that’s a separate conversation). We all get frustrated. None of us are perfect. And there is nothing to feel guilty about. 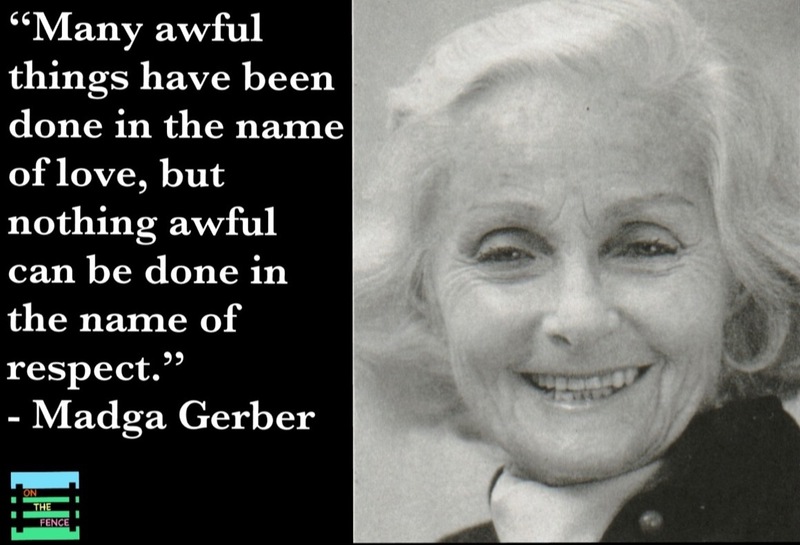 I am suggesting that, for many of us, those frustrations, especially when repeated, can wear on us (because we are indeed human) and become the lens through which we view and speak about our children, and in turn, that lens clouds or colors our attempts to connect with them, creating a loop of disappointment, frustration, challenging behavior, and even desperation. I am suggesting mindfulness and presence as a way to come back from those all-too-real-and-natural frustrations–without guilt, but with accountability–and re-center ourselves on respect, the magic potion that will bring us to solutions and connection and long term positive relationships with our children as they grow. I am asking you to join me in choosing respect, returning to respect, remembering respect. Or even just signing up to try it out for a couple of weeks and see how it works. There’s a signup sheet going around. Thanks so much for coming. Before you leave, take a few minutes to connect with the other parents here. This sort of work–this returning to respect–cannot be done without the support of other parents. We need one another. We need to be able to call or email or text another parent who is choosing respect and say “I’m gonna kill this kid” or “I want to run away” or “If I see one more eye roll, I’m gonna throw something.” Our children need outlets for their overwhelming emotions–somehow, we all know that. So do we. So say it (not on facebook or the internet if you can help it, those things live forever, save those for the good stuff). Say it to another parent who knows, with all their being, that you need to say it in order to return to respect. Find those people (in person or online) who will say “Been there” or “I’m sorry it’s so rough today” and will, at the same time, remind you (without saying it, because hearing it is irritating and humiliating) of your commitment to respect. Find those people. Be one of those people for others. Chat amongst yourselves. Thanks again for coming. Great to see you, I’m so glad we had this time together. Don’t forget your stuff on the way out. Or maybe you don’t need some of it anymore. Feel free to leave it here. We’ll throw it in the recycling bin. Someone will probably come along and turn it into art. More power to ’em. This entry was posted in breathing, challenging behavior, children, emotions, mindful parenting, mindfulness, parenting, respect, respectful caregiving, self-care and tagged breathing, children, mindful parenting, mindfulness, positive regard, self-care, self-fulfilling prophecy. Bookmark the permalink. Great parenting advice – when you read it, you’ll feel like you’re right in the room with the author. A great approach and a great article. Just one nuance that always has a huge emotional charge for me as I have a big inner problem (rooted in my own childhood traumas) – you write how we get to be with our children and to enjoy our time with them. What if I don’t? I have so many inner battles with my 1st child. I do not enjoy her company. I have to force myself most of the time. I do not like to hug her. It’s almost repulsive. I still do. Clenching my teeth. I do not like her personality or the way she looks. I just don’t. I try to be at my best with her. Notice her positive sides. Be respectful. Be gentle. Judge less, use a softer voice, etc. But this all is work. Hard work. I am so tired of all the guilt and pain it causes. I constantly worry of damaging her. We can feel the nuances don’t we. I bet she understands and feels all of that on some levels. It’s awful. I do not like my child. I care for her. I do not like her. What then? I hear and feel your heartbreak and your concern for the impact of your own trauma on your daughter. You mention that she is your “first daughter”, implying that there are others (toward whom you do not feel a similar dislike?) I am going out on a limb here, but I am wondering if you see yourself or your own experience in her? That can be so terribly hard and triggering for a survivor of childhood trauma. How old is she? You ask “What then?” There is no easy solution. As you have conjectured, “pretending” that you feel differently doesn’t really work. They always know how we feel, including how we feel about them. It sounds as if you have a lot of work ahead of you if this is something you seek to heal and reverse. Sadly, there is no easy way–childhood traumas leave scars in a powerful way, and those triggers will remain until they are dealt with directly. The only “what then”, in my view, is to commit yourself to intensive healing and therapy to thoroughly deal with your own childhood traumas, and (depending on her age) maybe family sessions as well so that the two of you might find places of connection. Both you and your daughter deserve to heal from this, and to have a nurturing and loving relationship. All the best in your journey. Thanks a lot for your response. My daughter is 14. It was all fine until the “terrible 3’s” period. Then it went South. I suppose I do identify with her a lot… That doesn’t help to not take things personally. Looking for a solution to my inner problems I found out I am the classical “Hero child”, when I read the description it was all about me… I’ve grown up in a family with an authoritarian alcoholic, later married an alcoholic (now divorced). I feel apart from my own childhood I unconsciously put a lot of “blame” related to my unhappy marriage on my daughter as she also reminds me of her father a lot.. It all feels so unfair towards her and I am battling my own mind. I feel trapped in this battle. Unfortunately I do not have means for psychotherapy (I’ve tried before but fell out of it after a while) and am looking into alternative ways of getting out of the situation. Not sure if there are any though.